ROBERT GORDON MENZIES - Loved, hated and revered throughout his life. To some he was a master politician, a 'prince among men', a colossus bestriding his time; to other he appeared aloof and arrogant, an autocrat, a one-man parliament. This personal memoir by the Honourable Sir Percy Joske, G.M.C.,Q.C., a close personal friend and colleague of Menzies, his values and beliefs. Sir Robert Gordon Menzies, (20 December 1894 – 15 May 1978), Australian politician, was the 12th and longest-serving Prime Minister of Australia. His first term as Prime Minister commenced in 1939, after the death in office of the United Australia Party leader Joseph Lyons and a short-term interim premiership by Sir Earle Page. His party narrowly won the 1940 election, which produced the first hung parliament in Australian history, with the support of independent MPs in the House. A year later, his government was brought down by those same MPs crossing the floor. He spent eight years in opposition, during which he founded the Liberal Party of Australia. He again became Prime Minister at the 1949 election, and he then dominated Australian politics until his retirement in 1966. Menzies was renowned as a brilliant speaker, both on the floor of Parliament and on the hustings; his speech "The Forgotten People" is an example of his oratorical skills. Throughout his life and career, Menzies held strong beliefs in the Monarchy and in traditional ties with Britain. In 1963 Menzies was invested as the first and only Australian Knight of the Order of the Thistle. Menzies is regarded highly in Prime Ministerial opinion polls and is very highly regarded in Australian society for his tenures as Prime Minister. In 1928, Menzies gave up his law practice to enter state parliament as a member of the Victorian Legislative Council from East Yarra Province, representing the Nationalist Party of Australia. His candidacy was nearly defeated when a group of ex-servicemen attacked him in the press for not having enlisted, but he survived this crisis. The following year he shifted to the Legislative Assembly as the member for Nunawading. Before the election, he founded the Young Nationalists as his party's youth wing and served as its first president. He was Deputy Premier of Victoria from May 1932 until July 1934. Menzies transferred to federal politics in 1934, representing the United Australia Party (UAP--the Nationalists had merged with other non-Labor groups to form the UAP during his tenure as a state parliamentarian) in the upper-class Melbourne electorate of Kooyong. He was immediately appointed Attorney-General and Minister for Industry in the Lyons government. In 1937 he was appointed a Privy Councillor. In late 1934 and early 1935 Menzies unsuccessfully prosecuted the Lyons government's case for the attempted exclusion from Australia of Egon Kisch, a Czech Jewish communist. Because of this, some accused Menzies of being pro-Nazi, whilst others saw it as an early example of his strong opposition to communism. Following the outbreak of World War II Menzies found it necessary to distance himself from the controversy by claiming Interior Minister Thomas Paterson was responsible since he made the initial order to exclude Kisch. Animosity developed between Page and Menzies which was aggravated when Page became Acting Prime Minister during Lyons' illness after October 1938. Menzies and Page attacked each other publicly. He later became deputy leader of the UAP. His supporters said he was Lyons's natural successor; his critics accused Menzies of wanting to push Lyons out, a charge he denied. In 1938 his enemies ridiculed him as "Pig Iron Bob", the result of his industrial battle with waterside workers who refused to load scrap iron being sold to Imperial Japan. In 1939, however, he resigned from the Cabinet in protest at postponement of the national insurance scheme. With Lyons' sudden death on 7 April 1939, Page became acting Prime Minister until the UAP could elect a leader. On 18 April, Menzies was elected Leader of the UAP and was sworn in as Prime Minister eight days later. A crisis arose almost immediately, however, when Page refused to serve under him. In an extraordinary personal attack in the House, Page accused Menzies of cowardice for not having enlisted in the War, and of treachery to Lyons. Menzies then formed a minority government. When Page was deposed as Country Party leader a few months later, Menzies reformed the Coalition with Page's successor, Archie Cameron. In September 1939, Menzies found himself a wartime leader of a small nation of 7 million people that depended on Britain for defence against the looming threat of the Japanese Empire, with 100 million people, a very powerful military, and an aggressive foreign policy that looked south. He did his best to rally the country, but the bitter memories of the disillusionment which followed the First World War made this difficult. Added to this was the fact that Menzies had not served in that war, and that as Attorney-General and Deputy Prime Minister, Menzies had made an official visit to Germany in 1938, and like his Opposition at the time, supported Neville Chamberlain's policy of Appeasement. At the 1940 election, the UAP was nearly defeated, and Menzies' government survived only thanks to the support of two independent MPs, Arthur Coles and Alex Wilson. The Australian Labor Party (ALP), under John Curtin, refused Menzies' offer to form a war coalition, and also opposed using the Australian army for a European war, preferring to keep it at home to defend Australia. The ALP did agree to participate in the Advisory War Council, however. Menzies sent the bulk of the army to help the British in the Middle East and Singapore, and told Winston Churchill the Royal Navy should strengthen its Far Eastern forces. In 1941 Menzies spent months in Britain discussing war strategy with Churchill and other leaders, while his position at home deteriorated. The Australian historian David Day has suggested that Menzies hoped to replace Churchill as British Prime Minister, and that he had some support in Britain for this. Other Australian writers, such as Gerard Henderson, have rejected this theory. When Menzies came home, he found he had lost all support, and was forced to resign as Prime Minister. However, the UAP was so bereft of leadership that it was forced to allow the Country Party leader, Arthur Fadden, to become Prime Minister even though the Country Party was the junior partner in the Coalition. Menzies was very bitter about what he saw as this betrayal by his colleagues, and almost left politics. However, he was prevailed upon to remain UAP leader and Minister for Defence Co-ordination in Fadden's government. Fadden's government was defeated in Parliament later in 1941, and Labor formed a government under John Curtin. Menzies argued that he should become Leader of the Opposition, but most of his colleagues favoured Fadden. Menzies resigned the leadership in disgust and was succeeded by Billy Hughes. However, Menzies remained an opposition frontbencher under Fadden. In 1943 Curtin won a huge election victory. Hughes resigned as UAP leader, and Menzies returned to the leadership. Fadden yielded the post of Opposition Leader back to Menzies as well. During 1944 Menzies held a series of meetings at 'Ravenscraig' an old homestead in Aspley to discuss forming a new anti-Labor party to replace the moribund UAP. This was the Liberal Party, which was launched in early 1945 with Menzies as leader. But Labor was firmly entrenched in power and in 1946 Curtin's successor, Ben Chifley, was comfortably re-elected. Comments that "we can't win with Menzies" began to circulate in the conservative press. Over the next few years, however, the anti-communist atmosphere of the early Cold War began to erode Labor's support. In 1947, Chifley announced that he intended to nationalise Australia's private banks, arousing intense middle-class opposition which Menzies successfully exploited. The 1949 coal strike, engineered by the Communist Party, also played into Menzies' hands. In the December 1949 election, Menzies won power for the second time in a massive landslide, scoring a 48-seat swing—still the largest defeat of a sitting government at the federal level in Australia. In 1950 Menzies was awarded the Legion of Merit (Chief Commander) by U.S. President Harry S. Truman for "exceptionally meritorious conduct in the performance of outstanding services 1941–1944 and December 1949 – July 1950". Although Menzies had a comfortable majority in the House, the ALP-controlled Senate made life very difficult for him. In 1951 Menzies introduced legislation to ban the Communist Party, hoping that the Senate would reject it and give him an excuse for a double dissolution election, but Labor let the bill pass. It was subsequently ruled unconstitutional by the High Court. But when the Senate rejected his banking bill, he called a double dissolution and at the election won control of both Houses. Later in 1951 Menzies decided to hold a referendum on the question of changing the Constitution to permit the parliament to make laws in respect of Communists and Communism where he said this was necessary for the security of the Commonwealth. If passed, this would have given a government the power to introduce a bill proposing to ban the Communist Party (although whether it would have passed the Senate is an open question). The new Labor leader, Dr H. V. Evatt, campaigned against the referendum on civil liberties grounds, and it was narrowly defeated. This was one of Menzies' few electoral miscalculations. He sent Australian troops to the Korean War and maintained a close alliance with the United States. Economic conditions, however, deteriorated, and Evatt was confident of winning the 1954 elections. Shortly before the elections, Menzies announced that a Soviet diplomat in Australia Vladimir Petrov, had defected, and that there was evidence of a Soviet spy ring in Australia, including members of Evatt's staff. Evatt felt compelled to state on the floor of Parliament that he'd personally written Soviet Foreign Minister Vyacheslav Molotov, who assured him there were no Soviet spy rings in Australia. This Cold War scare enabled Menzies to win the election; although Labor won a majority of the two-party-preferred vote, it came up eight seats short of toppling the Coalition. Evatt accused Menzies of arranging Petrov's defection, but this has since been disproved: he had simply taken advantage of it. The aftermath of the 1954 election caused a split in the Labor Party, with several anti-Communist members from Victoria defecting to form the Australian Labor Party (Anti-Communist). The new party directed its preferences to the Liberals, and Menzies was comfortably re-elected over Evatt in 1955. Menzies was reelected almost as easily in 1958, again with the help of preferences from what had become the Democratic Labor Party. By this time the post-war economic recovery was in full swing, fuelled by massive immigration and the growth in housing and manufacturing that this produced. Prices for Australia's agricultural exports were also high, ensuring rising incomes. Labor's new leader, Arthur Calwell, gave Menzies a scare after an ill-judged squeeze on credit – an effort to restrain inflation – caused a rise in unemployment. At the 1961 election Menzies was returned with a majority of only two seats. But Menzies was able to exploit Labor's divisions over the Cold War and the American alliance, and win an increased majority in the 1963 election. An incident in which Calwell was photographed standing outside a South Canberra hotel while the ALP Federal Executive (dubbed by Menzies the "36 faceless men") was determining policy also contributed to the 1963 victory. This was the first "television election," and Menzies, although nearly 70, proved a master of the new medium. Menzies' policy speech was televised on 12 November 1963, a method that "had never before been used in Australia". The effect of this form of political communication was studied by Colin Hughes and John Western, who published their findings in 1966. This was itself the first such detailed study in Australia. In 1963, Menzies was appointed a Knight of the Order of the Thistle (KT), the order being chosen in recognition of his Scottish heritage. He is the only Australian ever appointed to this order, although three British governors-general of Australia (Lord Hopetoun; Sir Ronald Munro Ferguson, later Lord Novar; and Prince Henry, Duke of Gloucester) were members. He was the second of only two Australian prime ministers to be knighted during their term of office (the first prime minister Edmund Barton was knighted during his term in 1902). In 1965, Menzies committed Australian troops to the Vietnam War, and also to reintroduce conscription. These moves were initially popular, but later became a problem for his successors. Despite his pragmatic acceptance of the new power balance in the Pacific after World War II and his strong support for the American alliance, he publicly professed continued admiration for links with Britain, exemplified by his admiration for Queen Elizabeth II, and famously described himself as "British to the bootstraps". Over the decade, Australia's ardour for Britain and the monarchy faded somewhat, but Menzies's had not. At a function attended by the Queen at Parliament House, Canberra, in 1963, Menzies quoted the Elizabethan poet Thomas Ford, "I did but see her passing by, and yet I love her till I die". Menzies retired on Australia Day 1966, ending 38 years as an elected official. To date, he is the last Australian Prime Minister to leave office on his own terms. He was succeeded as Liberal Party leader and Prime Minister by his former Treasurer, Harold Holt. Although the coalition remained in power for almost another seven years (until the 1972 Federal election), it did so under four different Prime Ministers. On his retirement he became the thirteenth Chancellor of his old University of Melbourne, and remained the head of the University from March 1967 until March 1972. Much earlier in 1942, he had received the first honorary degree of Doctor of Laws of Melbourne University. His responsibility for the revival and growth of university life in Australia was widely acknowledged by the award of honorary degrees in the Universities of Queensland, Adelaide, Tasmania, New South Wales, and the Australian National University and by thirteen universities in Canada, the U.S.A. and Britain, including Oxford and Cambridge. Many learned institutions, including the Royal College of Surgeons (Hon. FRCS) and the Royal Australasian College of Physicians (Hon. FRACP), elected him to Honorary Fellowships, and the Australian Academy of Science, for which he supported its establishment in 1954, made him a fellow (FAAS) in 1958. In July 1966 the Queen appointed Menzies to the ancient office of Lord Warden of the Cinque Ports and Constable of Dover Castle, taking official residence at Walmer Castle during his annual visits to Britain. He toured the United States giving lectures, and he published two volumes of memoirs. At the end of 1966 Menzies took up a scholar-in-residence position at the University of Virginia. Menzies encountered some public tribulation in retirement; however, when he suffered strokes in 1968 and 1971, he faded from public view. Menzies died from a heart attack in Melbourne in 1978 and was accorded a state funeral, held in Scots' Church, Melbourne, at which Prince Charles represented Queen Elizabeth II .Menzies was Prime Minister for a total of 18 years, five months, and 12 days, by far the longest term of any Australian Prime Minister, and during his second term he dominated Australian politics as no one else has ever done. He managed to live down the failures of his first term in office, and to rebuild the conservative side of politics from the nadir it hit in 1943. Menzies also did much to develop higher education in Australia, and he also made the increasing development of Canberra one of his big projects. However, it can also be noted that while retaining government on each occasion, Menzies lost the two-party-preferred vote in 1940, 1954, and 1961. 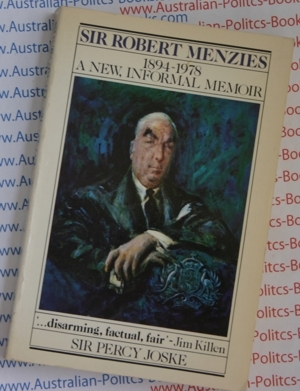 Critics say that Menzies's success was mainly due to the good luck of the long post-war boom and his manipulation of the anti-communist fears of the Cold War years, both of which he exploited with great skill. He was also crucially aided by the crippling dissent within the Labor Party in the 1950s and especially by the ALP split of 1954. Several books have been filled with anecdotes about him and with his many witty remarks. While he was speaking in Williamstown, Victoria, in 1954, a heckler shouted, "I wouldn’t vote for you if you were the Archangel Gabriel" – to which Menzies coolly replied "If I were the Archangel Gabriel, I’m afraid you wouldn't be in my constituency." Planning for an official biography of Menzies began soon after his death, but it was long delayed by Dame Pattie Menzies' protection of her husband's reputation and her refusal to co-operate with the appointed biographer, Frances McNicoll. In 1991, the Menzies family appointed Professor A.W. Martin to write a biography, which appeared in two volumes, in 1993 and 1999.